The irony of this statement has not been lost on many. The Boise Knitting Factory, second home to many local metal heads, welcomed Sweden’s In Flames for the first major concert since its reopening after a fire nearly burnt the building down last summer. This satirical comeback was either cleverly thought out, or just a comical accident, I think it was the latter. Regardless, everyone seems to be thrilled one of the most beloved venues is back in business. What made the night even sweeter, were the local bands that set the pace and started the night off. We Were Giants, Traitors Gate, and Karin Comes Killing lit up the stage and got the crowd headbanging, setting the table for In Flames. This was the first time for me seeing We Were Giants. who released their new album, The Declaration, last summer. I was speechless. I still am a little bit. They had so much energy and stage presence, you didn’t want to look away or blink to miss even a second of their set. Consisting of band members Kenneth Logan Peel (screams and vocals), Blake Davis (clean vocals), Josh Street (guitar), and Michael Flawless Faylor (drums), We Were Giants delivered outstanding breakdowns that were epically executed. Street brought a high level of riffs and sound that is tough to do with one guitarist. With Faylor unable to perform, Dillon Carey handled stick duties and his drumming was spectacular and entertaining to watch. Davis’s clean vocals were beautifully carried out and reminded me slightly of Brandon Boyd of Incubus. The jaw dropper for me though, was Peel’s vocal range from screams to singing and everything in between. My eyes had a difficult time leaving him their whole set because of the insane energy and raw talent that all came from one person. They quickly had the crowd warmed up and ready to go with their powerful stage presence and high energy metal. The intertwined synthesizer, which is normally not my thing, was a breath of fresh air since it was done well and implemented perfectly. This is a local band you do not want to miss and they have become a new favorite for this metalhead. Traitors Gate is always a special treat for anyone watching them. I have seen this band multiple times and I am never disappointed. Mister Y (vocals), Ken Mansfield (guitar), Colby Dees (bass), and Jayce Keffer (drums) are another powerhouse Boise act. If these guys know how to bring anything, it is the metal. They initially let the crowd know this set was to be recorded and did an impeccable job of getting the crowd excited and involved throughout the set. Mansfield is always a pleasure to watch with his incredible guitar skills and solo magic. Dees tears it up on bass and his contagious smile drags you right along for the fun. You can tell he loves what he does, and he does it well. Keffer is one of the most amazing drummers to watch in our scene. He is brilliant and gifted in his playing and he always draws your attention when he’s behind the kit. Mister Y does a great job of involving the crowd, even letting them sing a lyric or two during the set. Traitors Gate is one of the most hardest working band’s on the scene. They play often and they play heavy. Now where is our second album? Karin Comes Killing is far from a new band to the Boise scene. They have been around for many years. They have made a recent comeback and announced they are working on a new album. Some of my favorite local musicians are involved with this project. Members; Merlin Pursley (lead guitar), Scott Elliott (guitar), Stymie Grille (bass), Richie Cesler (drums) and David Waters (vocals) are the brains behind KCK. Not only are these some of the best Boise has to offer, but they are also wonderful humans. A local favorite for many reasons, KCK tore up The Knit and brought an intensity that excited and ignited the crowd. Pursley is a damn magician on the guitar, he makes it look so effortless, yet he kills the solos and pinch harmonics along with his wizardry riffs. Elliott is not only a superb compliment to Pursley’s lead, he also shines so bright you can tell how much he enjoys the stage. Stymie crushes the bass notes that groove incredibly well with his guitar counterparts. Cesler is another absolutely stunning drummer in the local area that is incredible to watch. Yet again, my eyes struggled moving away from him due to his highly talented and entertaining presence. Waters drives it home with stellar vocals. I, for one, am looking forward to new music from this old favorite. In Flames. I cannot remember the last time I was this excited for a show. The Knit is back, local favorites are playing, and In Flames are set to torch the venue with a headline set on their off day from touring alongside Within Temptation. 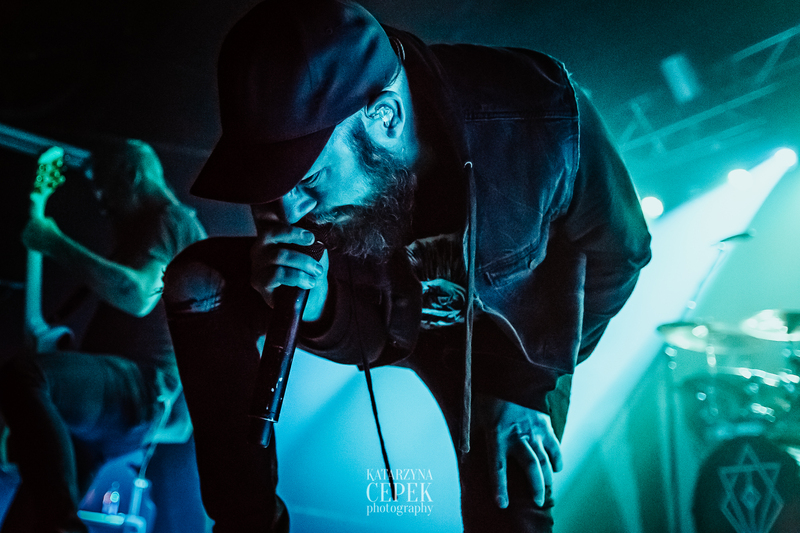 I was unsure what to expect out of In Flames, and when singer Anders Friden stated he had the flu and was using the microphone stand to hold himself up, I was worried. I was not sure if they were going to be able to perform well, and I was not sure if they were able to complete a whole performance. Here is the insane thing, not only did they complete their set, but he nailed all his lyrics, both screams and cleans. They were engaging and captivating, creating an impressive set. This is how this Swedish band rolls, and I have the utmost respect for them. I screamed, I sang my heart out, I head banged, and I had to have a few days to recover, because I am not as young as I apparently wanted to be this night. In Flames is made up of Swedish bad asses; Anders Fridén (vocals) Björn Gelotte (lead guitar) / Niclas Engelin (guitar) Bryce Paul (bass), and Tanner Wayne (drums). Unfortunately, Engelin had a family emergency, so was unable to attend this tour. Thankfully they had a notable fill in guitarist, the legendary Chris Broderick (Act of Defiance, Megadeth, Jag Panzer), who apparently likes to eat tuna and works out frequently according to Friden. Despite Friden’s illness, he was still full of jokes in between songs. They started their set off with a new song “Voices” from their most recent release, I, The Mask. The enticing riff set the pace for a compelling start to an impressive show. Heavy and enchanting “Everything’s Gone” came next, which I believe to be their heaviest song of the night. This song has such an alluring spirit that hits you right in your soul. His screams are ridiculous and awe-inspiring. “Pinball Map”, my personal favorite by them, was otherworldly to see. Gelotte is one of the most fascinating guitarists I have ever seen. He is so calm and efficient in his playing, almost like Slowhand Eric Clapton, yet is incredibly passionate and connected. I was thoroughly impressed by him, time and time again. As much as I would love to talk about each and every song, because they were all just that good, I will try to narrow it down to a few. “(This is Our) House” had the crowd yelling along and pumping their fists. I was not sure how I felt about this song at first. It has quickly become one I have started to love and found myself yelling along and getting chills as they yelled too. “I Am Above,” my favorite new In Flames song, was spellbinding and mesmerizing. I am surprised I had a voice after this one. Pretty sure this is where my 20-year-old self attempted to emerge and bring the pain for the following days. “Cloud Connected” brought all the emotions, all the people together, and old and new In Flames fans alike. Friden’s vocals were miraculous and the musical composition was impeccable. They ended with the ever-fitting “The End”, and melted the face off the rest of the crowd who inconceivably still had faces to melt by this time. In all, the band played a pretty good mix of material, with emphasis on I, The Mask, and their previous effort, Battles. Broderick did an outstanding job, especially given he only had about 48 hours to learn the songs before the tour. It was a treat to see the band in this temporary incarnation, and to get one of the few headlining shows on this North American Tour. They were also kind enough to do a pre-show Meet and Greet at The Record Exchange. I will tell you a few things I learned from this night of metal; We Were Giants are a force to be reckoned with, Traitors Gate is a steady and persistent metal powerhouse, Karing Comes Killing is slaughtering their comeback in all the right ways, and In Flames lit a concert fire in me and is a band I now know never to miss anytime they are in town. The Knit’s first metal show since their unfortunate fire and first show of the year was something I will be talking about for years to come. Every band brought it, every band killed it, every band deserve the praises and “we are not worthy’s” that come their way. I had to cauterize the metaphorical burns from my vocals and body from head down to my incinerated toes. As the crowd left, reduced to ashes, I saw only smiles, faces of awe, and words of how insanely magical the show was. Just another day in the books for this metalhead to write in my Metal Nation diary for all to read.